Earlier this month, at the 2019 AHRA Spring Conference in San Antonio, I had the great fortune of being a presenter again. While this wasn’t my first opportunity to stand before the members of our great organization, this session was special for me because the AHRA, along with our generous partners at Vital Images, hosted a first-ever Networking Reception for Military Professionals which preceded my session. The reception was the brainchild of AHRA members Mark Suckle and this year’s Spring Design Team Chair Ms. Maureen Firth. Based on the great reaction we had at the military recognition lunches held at the 2018 AHRA Annual Meeting, it was decided to plan a Military Networking Reception for this year’s Spring Conference. Mark, who is an Air Force Senior Master Sergeant (Retired) was aware that San Antonio is not only the home of military medicine, but it is also where all three branches of service train their respective Radiologic Technologists at the Joint Service Medical Education & Training Campus (METC) at historic Fort Sam Houston. 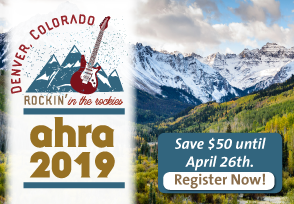 Both Mark and Maureen were kind enough to include me in their wonderful idea to expose the AHRA to the military so that we can share our vision that starts off with: “The AHRA will be the association of choice for leaders in medical imaging management”. One goal for the evening was to provide the military technologists the chance to learn about the AHRA and what it provides to imaging managers in a small, familial and collegial setting. As always, the current members of the AHRA showed up in force to not only speak with our guests but to also welcome them on to the team, if even just for the evening. Our second goal for the night was to afford our guests the opportunity to grow their network for their eventual transition from military service to becoming viable contributors in the civilian sector. Once again, I was amazed at all of the AHRA members who were making on the spot connections; and dare I say screening future additions to their team? Whether you know this or not you made great impressions for several of the military members and they have reached out to me to speak to that fact. As the Congress looks at downsizing the force over the next few years, the conversations you had, resonated with my military brothers and sisters about their self-worth and what they will bring to the team once they trade the cloth of our nation for the ones with your hospital logo. Our guests ran the gamut of the Army, Navy and Air Force in various stages of their military careers and experience as technologists. In addition to the instructors from METC, in attendance we also had Soldiers and Airmen from the Brooke Army Medical Center, which is the only Level 1 Trauma & Burn Center in the Department of Defense, the Wilford Hall Ambulatory Surgical Center on Lackland Air Force Base, and Soldiers attending the Air Force Noncommissioned Officer Academy’s Advanced Leadership Course. Thanks to the AHRA Board, Mark, and Maureen for recognizing the importance of including our service men and women while we were in town. What a great opportunity if was to represent our important and singularly patriotic organization. John Beall is the Deputy Commander Patient Support Services Senior Clinical NCO (Asst. VP) at Madigan Army Medical Center in Tacoma, WA. He can be reached at johnjbeall@gmail.com. Court Deference to Agency Interpretations of Ambiguous Regulations: How Much is Too Much? Outstanding article. Thanks to all the AHRA military members for their service.